Retro electric Trabant? Toy cars? What? Do you know what a Trabant is? I'll, let you visit Wikipedia if you don't. Let's just say it was a horrible East German car. 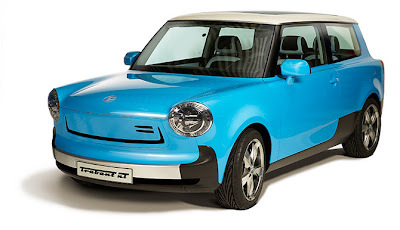 Anyway, there were rumors of a Trabant return, and those rumors were confirmed at the Frankfurt Auto Show this week. The new Trabbi is called the Trabant nT, which stands for "new thinking." This new Trabbi will apparently to 100 miles on a charge, do 80 mph, and has Li-Ion batteries. Great. So what's so odd? The Trabant was considered one of the uglier cars ever. I don't think this new one is too bad, though. It's kinda Volkswagen Type III-ish, kinda MINI-like, but not really. Allegedly the Trabant nT will go for about $20,000 Euro or $29,000 if it ever sees the light of day. Apparently, Herpa wants to see the vehicle for sale by 2012.